MIAMI, Florida — Sen. Marco Rubio officially suspended his campaign for president this evening after losing to billionaire presidential candidate Donald Trump in Tuesday’s primary election in Florida. “So while it is not God’s plan to be president in 2016 or maybe ever, and while today my campaign is suspended, the fact that I’ve even come this far is evidence of how special America truly is,” he said. Supporters booed as Rubio congratulated Trump for winning his home state, as the networks declared him the winner shortly after the polls closed in Florida. Rubio stood with his family in the atrium of the Florida International University basketball arena while delivering his exit speech. The doors to the more expansive court were sealed, as about 300 supporters crammed into the smaller space. As he spoke, a couple of his fans shouted “Go to the convention!” — but it was clear that the fight to stop Donald Trump was over. One person in the audience dressed in a blue coat and red tie proudly put a “Make America Great Again” Trump campaign hat on his head and shouted “You lost Marco! !” as Rubio supporters booed. Some in the audience reacted by ripping the heckler’s hat off and throwing it across the room before security led him out. But Rubio referred to Trump’s political revolution, admitting that the Republican party should have reacted more quickly to address the American people’s concerns. “America is in the middle of a real political storm, a real tsunami, and we should have seen this coming,” he said. Rubio admitted that the dynamic Republican victories of 2010 and 2014 that were fueled by conservative and tea party activists had fallen short in delivering needed change in Washington D.C. Although Rubio was a favored candidate by many in the Republican establishment, the Florida senator called for a more principled “new political establishment” that wouldn’t tell young people to “wait their turn” to lead. 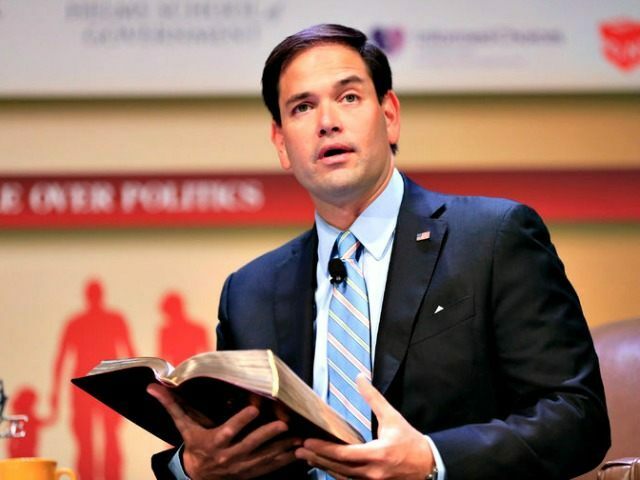 Rubio ended his speech citing the words of King David in 1 Chronicles. “Yours, O LORD, is the greatness and the power and the glory and the victory,” he said, reciting the verses from Scripture.